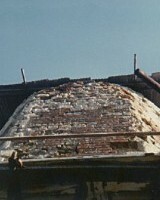 By 1979 the remnants of the cap and some of the running gear had been removed leaving just the Main Shaft in place. 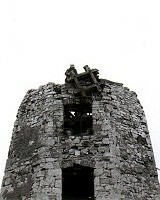 This left the stonework of the tower accessible to allow for urgent repairs. 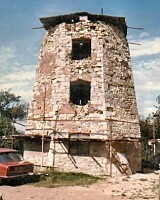 The mill tower is an unusual mix of stone and brick (assumed to be repairs to the original tower stonework). 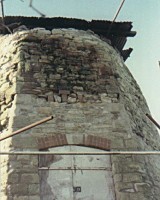 The problems stemmed from the degradation of the mortar used to hold the tower together. 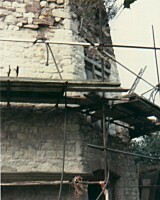 This was such a problem that much of the stonework was not viewed as safe. 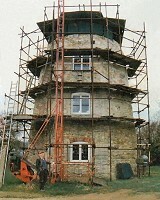 Rex Powell was instrumental in organising repairs and with his help a forest of scaffolding soon sprang up around the mill. The stonework was treated and repointed from top to bottom inside and out, a process that took a long time. Inside the mill the lower floor was braced and a set of new windows was added. 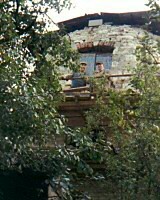 The state of the tower in 1978. 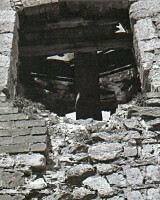 Example of just how decayed the stonework was. Ground floor complete and the scaffolding reaches higher. 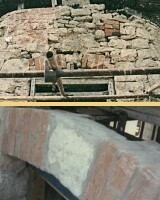 The door and window mantles before and after restoration. Note the gaps in the stone and brick work. The contrast between the stonework before and after work. Another problem was the weeds that had grown in the mortar. Rex Powell and Jimmy Munt who undertook most of the work. By the late eighties a lot of the work is now completed.